Diabetic Retinopathy (DR) is the most common complication of Diabetes Mellitus (DM) and a leading cause of preventable blindness. Currently, DR is the leading cause of visual impairment in people of working age in the world . After 20 years of illness, approximately 90% of people with type 1 diabetes with and 60% of those with type 2 diabetes develop some degree of retinopathy . The presence of retinopathy is an early marker of microvascular complications. It can be classified into non-proliferative (mild, moderate and severe) and proliferative . Proliferative diabetic retinopathy starts with a progressive reduction in perfusion of the capillary bed in the retina. Neovascularization develops to compensate for this retinal ischemia . Table 1. Inclusion and exclusion criteria for entry into study. Dry eye is a multifactorial disease of the ocular surface. It is characterized by the loss of tear film homeostasis and is accompanied by ocular symptoms in which tear film instability and hyperosmolarity, ocular surface inflammation and neurosensory abnormalities play etiological roles . Nowadays, Dry Eye Syndrome (DES) is classified as evaporative and/or lacrimal aqueous layer deficiency (excess evaporation due to deficiency of the lipid layer). Due to its negative influence on the visual function and quality of life of patients, dry eye imposes a significant burden on public health . The tests for this diagnosis evaluate the stability of Tear Break-Up Time (TBUT), aqueous layer and lacrimal exchange (Schirmer test, fluorescein clearance, red phenol test and fluorophotometry), alteration of the ocular surface (dyes such as rose bengal and cytology) and qualitative analysis of the tear film (osmolarity and protein analysis) . Several tests are necessary to optimize the diagnosis of dry eye, as well as a symptom questionnaire . Studies have shown a higher incidence of dry eye among the patients with diabetes compared with patients without diabetes . However, information about dry eye in patients with proliferative diabetic retinopathy and laser therapy indication, particularly panretinal Photocoagulation (PRP), is not sufficient. 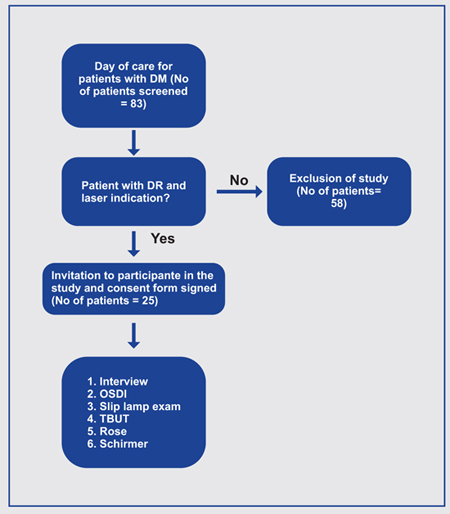 After informed consent was obtained and detailed explanation of the present study was provided, an initial clinical evaluation was performed, with anamnesis and complete ophthalmologic examination (Fig. 1). The anamnesis was directed to complaints of ocular pain and burning, tearing, blurred vision, photophobia, foreign body sensation or ocular dryness, weight on the eyelids and conjunctival hyperemia. Besides, patients were subjected to the Ocular Surface Disease Index () questionnaire. The OSDI is a questionnaire with 12 questions that are graded from 0 (zero) to 4. The total value ranges from 0 (zero) to 100 in which higher scores indicate more severe symptoms. Its final value is calculated by (sum of all scores) X 25 / number of questions answered . below are the questions that constitute the questionnaire: Have you experienced any of the following during the last week? Eyes that are sensitive to light, Eyes that felt gritty, Painful or sore eyes, Blurred vision, Poor vision; Have problems with your eye limited you in performing any of the following during the last week? Reading, driving at night, working with a computer or bank machine (ATM), Watching TV; Have your eyes felt uncomfortable in any of the situations during the last week? Windy conditions, Places or areas with low humidity (very dry), Areas that are air-conditioned. Afterward, one drop of rose bengal 1% eyedrop was instilled in the lower fornix of both eyes. The location and intensity of cornea coloration and the nasal and temporal conjunctivae were evaluated. A numerical scale quantified the impregnation of these three areas in each region, ranging from 0-3 (Bijsterveld scale), in which: 0 means absence of staining, 1 means punctate staining, 2 means staining with confluent points, and 3 means staining of large plaques. Scores greater than or equal to 3 were considered as positive indicative of dry eye . TBUT was less than 10 seconds (altered) in 21 patients (84%), and the Rose Bengal test staining was more than 3 in 13 patients (52%). The results of the Schirmer I test ranged from 2 to 35 mm, with a mean of 13.57 ± 9.78 mm. It was smaller than 10 mm in 15 patients (60%). These results are shown in Fig. (2). The mean age of the patients and the time of diagnosis of diabetes were similar to those of other published articles. In Table 5, it is observed, in the last five years, reports on the relationship between diabetes and dry eye syndrome . A cross-sectional study evaluated 99 patients, 61 with type 2 diabetes and 38 in the control group, to assess the possible increase in dry eye frequency in patients with diabetic polyneuropathy. Lacrimal film breaking time, Schirmer I test and corneal sensitivity were evaluated. The diagnosis of dry eye was observed more frequently in the group with diabetic polyneuropathy (44.4%) than in the control group (28.9%). Schirmer I, TBUT, and corneal sensitivity values were also worse in patients with diabetic polyneuropathy. The study suggests a relationship between dry eye and type 2 diabetes in patients with diabetic polyneuropathy due to reduced corneal sensitivity, compromising the balance of tear production and evaporation. Therefore, patients with diabetic polyneuropathy should be screened for dry eye to prevent damage to the ocular surface . Table 3. Time of diagnosis of Diabetes Mellitus and symptoms of dry eye. Table 4. Summary of participant responses to questions. Fig. (1). Flow chart demonstrating the study design. DM: Diabetes Mellitus; No: number; DR: Diabetic Retinopathy; OSDI: Ocular Surface Disease Index; TBUT: tear film break-up time. Fig. (2). 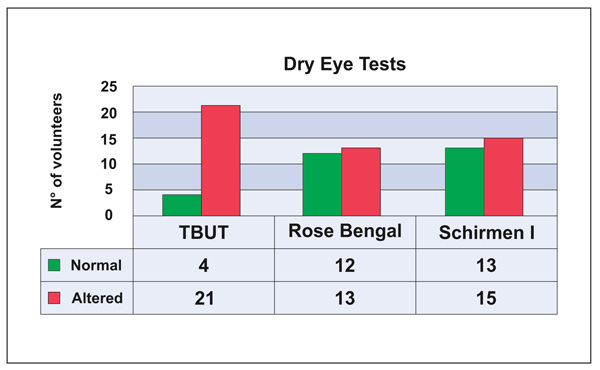 Results from dry eye tests (TBUT, Rose Bengal, and Schirmer) in subjects with proliferative diabetic retinopathy and laser therapy indication. TBUT: tear film break-up time. Table 5. Summary of studies showing the association between Dry Eye Syndrome and diabetes mellitus in the last five years. Beixinjing eye study. Significant association between the presence of dry eye, higher glycemia and elevation of glycosylated hemoglobin. with type 2 diabetes. Good glycemic control is a modifiable risk factor for both dry eye and tear film instability in patients with type 2 diabetes. Shujaat S, et al  (2017) Investigation of Ocular Tear Ferning in Controlled and Uncontrolled Diabetic Subjects. Acute increase in frequency and risk of developing dry eye disease in patients with type 1 diabetes. Al Houssien AO, et al  (2017) Magnitude of diabetes and hypertension among patients with Dry Eye Syndrome at a tertiary hospital of Riyadh, Saudi Arabia - A case series. Uncontrolled blood glucose levels appeared to be a risk factor for dry eye syndrome. Kan S, et al  (2017) The effects of blood glucose regulation on tear function tests in diabetic patients. DM is a hyperosmolar disorder that appears to cause elevation in the rate of ocular surface disease, especially if glycemia is poorly regulated. Diabetics and Non-Diabetics in District of Kuantan, Pahang. Dry eye symptoms were significantly associated with diabetics. especially in cases of neuropathy, and is associated with reduced corneal sensitivity. Hypoaesthesia of the cornea reduces patient symptoms. Lv H, et al  (2014) Meta-analysis and review on the changes of tear function and corneal sensitivity in diabetic patients. The sensitivity of the cornea was lower in diabetic patients than in the control group, suggesting worsening of the lacrimal functions in these patients compared to the control group. humanized transgenic model of type 1 diabetes. clinically relevant diabetes in mice. Najafi et al. studied 243 patients with type II diabetes. The prevalence of dry eye disease was 27.7%. A significant correlation was found between dry eye disease and diabetic retinopathy (P = 0.01), the former being more prevalent in people with proliferative diabetic retinopathy and/or with clinically significant macular edema (0.006). It can thus be concluded that dry eye disease is common in people with type 2 diabetes, especially in those with advanced stages of diabetic retinopathy . Another study performed tests on 100 subjects (50 healthy subjects in the control group and 50 subjects suffering from diabetes) aged between 50-70 years. In the group of diabetic patients (n = 50) it was found that 37 (74%) of them had lower values of tear secretion and 23 (46%) had lower values of TBUT. In the control group (N = 50), they found that 28 (56%) presented lower values of lacrimal secretion and 17 (34%) of them had lower TBUT values . Ma A, et al. , as in our study, included in the study time of diagnosis, on average 17 years, the age of patients 65 ± 11 years, and OSDI 16, observing statistical relevance in the last two. The mean levels reported by Kan S, and cols.20 of the OSDI score, the TBUT test, and the Schirmer test were altered after a decrease in glycemic levels, with OSDI ranging from a mean of 28.38 to 17.82 (p < 0.05). Aljarousha M, et al. observed a higher percentage of dry eye symptoms in diabetics, as well as tear film rupture time significantly different between diabetics and non-diabetics. Lv H et al  evaluated in their meta-analysis that the sensitivity of tear film in diabetic patients is worse in comparison to the control group. They also concluded that diabetic patients with proliferative diabetic retinopathy are more predisposed to impaired tear function and corneal sensitivity and should always be examined for changes in the tear film and ocular surface. The correlation of dry eye syndrome with gestational diabetes was not well established. It is believed that for the shortest time exposure to hyperglycemia . Caglar C, Demir E, Kucukler FK, Durmus M. A bibliometric analysis of academic publication on diabetic retinopathy disease trends during 1980-2014: A global and medical view. Int J Ophthalmol 2016; 9(11): 1663-8. Ting DS, Cheung GC, Wong TY. Diabetic retinopathy: Global prevalence, major risk factors, screening practices and public health challenges: A review. Clin Experiment Ophthalmol 2016; 44(4): 260-77. Said AM, Farag ME, Abdulla TM, Ziko OA, Osman WM. Corneal sensitivity, ocular surface health and tear film stability after punctal plug therapy of aqueous deficient dry eye. Int J Ophthalmol 2016; 9(11): 1598-607. Zeev MS, Miller DD, Latkany R. Diagnosis of dry eye disease and emerging technologies. Clin Ophthalmol 2014; 8: 581-90. Foulks GN, Forstot SL, Donshik PC, et al. Clinical guidelines for management of dry eye associated with Sjögren disease. Ocul Surf 2015; 13(2): 118-32. Aljarousha M, Badarudin NE, Che Azemin MZ. Comparison of dry eye parameters between diabetics and non-diabetics in district of Kuantan, Pahang. Malays J Med Sci 2016; 23(3): 72-7. Schiffman RM, Christianson MD, Jacobsen G, Hirsch JD, Reis BL. Reliability and validity of the ocular surface disease index. Arch Ophthalmol 2000; 118(5): 615-21. Klaassen-Broekema N, Mackor AJ, van Bijsterveld OP. The diagnostic power of the tests for tear gland related keratoconjunctivitis sicca. Neth J Med 1992; 40(3-4): 113-6. Ding J, Liu Y, Sullivan DA. Effects of insulin and high glucose on human meibomian gland epithelial cells. Invest Ophthalmol Vis Sci 2015; 56(13): 7814-20. Zou X, Lu L, Xu Y, et al. Prevalence and clinical characteristics of dry eye disease in community-based type 2 diabetic patients: The Beixinjing eye study. BMC Ophthalmol 2018; 18(1): 117. Ma A, Mask MS, Shin KC, et al. Association of long-term glycaemic control on tear break-up times and dry eye symptoms in Chinese patients with type 2 diabetes. Clin Exp Ophthalmol 2018 Jan 18. Shujaat S, Jawed M, Memon S, Talpur KI. Determination of risk factors and treatment of dry eye disease in type 1 diabetes before corneal complications at sindh institute of ophthalmology and visual sciences. Open Ophthalmol J 2017; 11: 355-61. Al Houssien AO, Al Houssien RO, Al-Hawass A. Magnitude of diabetes and hypertension among patients with dry eye syndrome at a tertiary hospital of Riyadh, Saudi Arabia - A case series. Saudi J Ophthalmol 2017; 31(2): 91-4. Kan S, Acar U, Kizilgul M, et al. The effects of blood glucose regulation on tear function tests in diabetic patients. J Fr Ophtalmol 2017; 40(6): 499-504. Achtsidis V, Eleftheriadou I, Kozanidou E, et al. Dry eye syndrome in subjects with diabetes and association with neuropathy. Diabetes Care 2014; 37(10): e210-1. Lv H, Li A, Zhang X, et al. Meta-analysis and review on the changes of tear function and corneal sensitivity in diabetic patients. Acta Ophthalmol 2014; 92(2): e96-e104. Imam S, Elagin RB, Jaume JC. Diabetes-associated dry eye syndrome in a new humanized transgenic model of type 1 diabetes. Mol Vis 2013; 19: 1259-67. Najafi L, Malek M, Valojerdi AE, et al. Dry eye and its correlation to diabetes microvascular complications in people with type 2 diabetes mellitus. J Diabetes Complications 2013; 27(5): 459-62. Manaviat MR, Rashidi M, Afkhami-Ardekani M, Shoja MR. Prevalence of dry eye syndrome and diabetic retinopathy in type 2 diabetic patients. BMC Ophthalmol 2008; 8(10): 10.